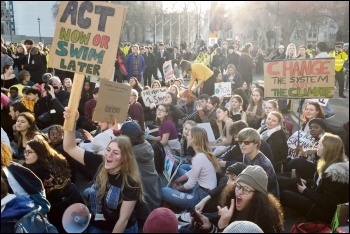 On Friday 15 March, tens of thousands of school and college students are expected to once again walk out of their classrooms to join the global strikes against climate change. The last strike, on 15 February, took place in unseasonal sunshine. This one is due to face winds of more than 50 miles an hour. While no one individual weather event can be conclusively proven to be connected to climate change, the trend is clear. The increase in extreme weather is a result of global warming. This year, by 1 March, there had been 480 wildfires across Europe. Over the previous ten years the average number by the same date was just 21. The Intergovernmental Panel on Climate Change (IPCC) estimates that there are only twelve years left to avoid devastating consequences. No wonder young people are taking to the streets to demand action to ensure a future for themselves and future generations. Profound anger at the capitalist politicians fiddling while the planet burns is also fuelled by the miserable existence that capitalism is offering working-class young people. Schools are turned into exam factories, with relentless pressure on students to achieve and - all too often - those that aren't expected to make the grade excluded in order to make the school's figures look good. Even for those who successfully jump through all the hoops, and graduate from university, the reward at the end is often a lifetime of debt, low-paid precarious work and overpriced, insecure housing. For those who don't go to university, work is often even lower-paid and more precarious. Wages for 18 to 21 year-olds fell 16% in real terms from 2008 to 2016. The services that, to some extent, existed to assist young people in the past have been destroyed by Tory austerity. Education Maintenance Allowance - a grant which provided up to £30 a week to 16 to 19 year-olds to help them stay in education - was abolished. Youth services provided by local councils have been slashed, almost to the point of extinction. Over 140,000 places have been cut since 2010 and many councils now provide no youth clubs at all. Of course, the Tories make no reference to this slashing of youth support services when they discuss the causes of the increase in knife crime. No wonder young people are angry and determined to demand a future - for the planet and for themselves. 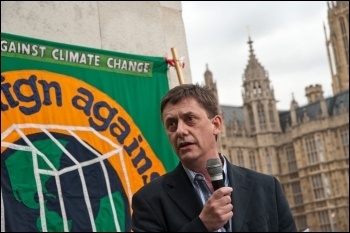 Socialists will be taking part in the 15 March protests calling for 'socialist change not climate change'. In the 2017 snap general election, young people, inspired by Jeremy Corbyn's anti-austerity manifesto, overwhelmingly voted Labour. If only the votes of under-25 year-olds had been counted not a single Tory would have been elected! Labour's 2017 election manifesto included important measures that, if implemented, would have improved the future of young people. These included a £10-an-hour minimum wage, mass council house building, and the abolition of tuition fees. To really give young people a decent future and, crucially, to take effective action against climate change would, however, require more thoroughgoing socialist measures. The giant corporations that dominate the economy are responsible for the bulk of carbon dioxide emissions. Since 1988, just 100 companies across the planet were responsible for 71% of all emissions. Up until 2010, only 90 companies were responsible for producing 63% of the cumulative emissions globally since the year 1751! Individuals changing their behaviour cannot save the planet while these giant corporations continue to wreck the environment. Capitalism is a blind, unplanned system where the only driving force is the need to maximise profits. The IPCC report estimates it would cost $900 billion per year to implement the programme it says is needed. Measures it says are urgently needed include at least a fivefold increase in investment in low carbon technologies, such as wind power and solar, and in energy efficiency measures like building carbon neutral homes. The deployment of renewables will have to increase by up to 14 times. In addition, green transportation will have to be introduced, including electric cars. Massive reforestation must be started, since trees absorb carbon dioxide. There is no prospect of the major banks and corporations that dominate the economy, in Britain and globally, accepting a $900 billion hit to their profits in order to take the action needed. On the contrary, their urge to maximise their own companies' profits leads to them bending and breaking even the very limited regulations that exist, often with the connivance of the pro-capitalist governments that have introduced those regulations. Look at the VW scandal in 2015. The world's second biggest vehicle manufacturer had systematically rigged its diesel emissions data. The EU took no action, pressured by governments to back their 'own' automotive industry. No matter that thousands of people die directly as a result of this pollution. Look at the way the Tories in Britain have encouraged fracking, despite the threat to the environment and our drinking water, in pursuit of quick profits. Of course, that does not prevent big companies using the environment as an excuse when it suits them. One of the reasons given for the threatened closure of the Honda plant in Swindon is the need to move to electric vehicles. The closure would lead to the devastating loss of 3,500 jobs at the plant, going up to 12,000 including workers including those who work in the supply chain. The only solution is to take major industry out of private hands in order to enable the development of a democratic socialist plan of production. Jeremy Corbyn should immediately pledge that an incoming Labour government would prevent all job losses by nationalising Honda Swindon under democratic working-class control. This would not mean having to continue to produce polluting petrol cars. On the contrary, an appeal should be made to the Honda workers to propose alternative, environmentally friendly production the plant could be turned to. The possibilities for this were shown in the past when, in 1976, the Lucas Aerospace workers produced an alternative plan to show how their weapons manufacturing plant could be turned to making a wide variety of socially useful products, from electric wheelchairs to kidney dialysis machines. This is one small example of what would be possible on the basis of democratic socialism. If a Corbyn-led government was to nationalise the 120 major corporations and banks that dominate the economy - backed by the active mass support of the working-class majority - it would be possible to harness the enormous wealth, science and technique that exists in Britain. This could then be used not for the profits of a few, but in order to meet the needs of all - and to begin an effective struggle to save the planet. It would be possible to immediately introduce measures to offer young people a decent future, such as a real living wage for all, a maximum working week of 35 hours with no loss of pay, and the right to secure housing. This could be combined with immediate measures to help save the environment, including a major shift to renewable energy, free or very cheap public transport for all, the mass building of carbon-neutral, high-quality council house building, grants to allow homeowners to insulate and improve their homes for free, and more. Of course, while an important beginning could be made in one country, to really tackle the danger of environmental catastrophe requires global action. However, a break with capitalism in one country leading to a serious plan to save the planet and meet peoples' needs, would create huge enthusiasm among working-class and young people globally. The $900 billion the IPCC says is necessary to limit global warming represents less than 2% of world economic output. It would be entirely possible, as part of a democratically organised socialist plan of production, to implement such spending without dislocating the economy or cutting across the other urgent needs of society. To achieve this, however, requires a global socialist plan of production. 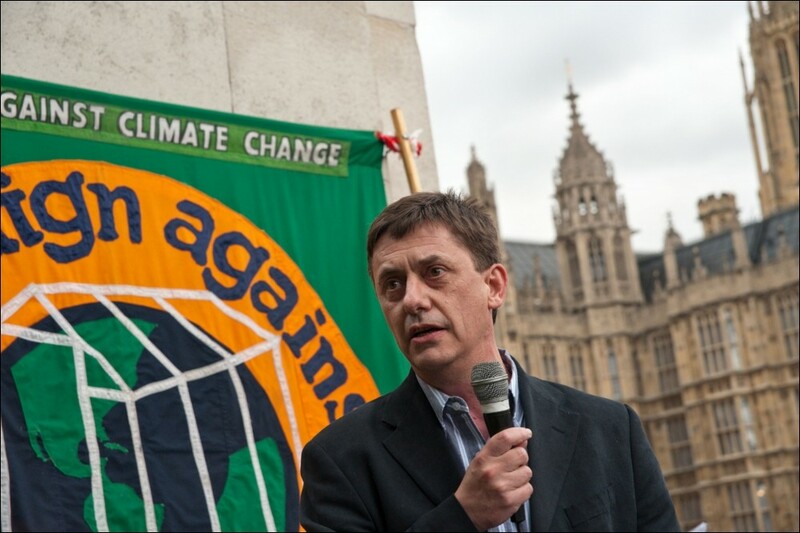 Young people protesting for action on climate change understand that something fundamental needs to change and should join the struggle for socialism as the only alternative to planet-destroying capitalism.